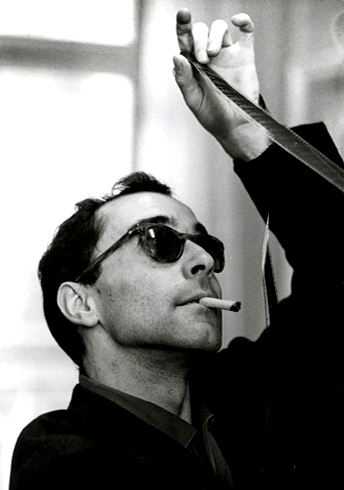 The intention of these posts remains simple – Learning about Godard’s work never stops for me and I would like to convert this opportunity into a venture for knowing the man and his work – for it is evident that knowing the master’s films definitely requires good knowledge about Godard himself. I would also like to briefly tell what I got from each of the film that will be presented here. I hope this one is a fairly interactive one. Godard is one filmmaker who has personally inspired and influenced me a lot(and I know several other filmmakers, cinephile and film enthusiast)so looking forward to your marathon with Godard, and hoping that I can share two or three things I know about him and exchange few movies. Thanks, Nitesh. It is from people like you that I am hoping to learn more. Looking forward to your feedback. P.S You said “influenced”. Do you make films too? Bro, that’s a wonderful idea. Though I have watched only a few of his movies, it wasn’t difficult to be awestruck by the audacity of this French intellectual and the most iconic enfant terrible of the world of cinema – a man who wanted to alter the very idiom of the medium. Be assured I’ll be a frequent visitor to this inspired blogathon of yours. Thanks a lot Shubhajit. I’ll try to do justice. Godard, I think, teaches us all to be an honest cinephile, that, to be an eternal student. Hence, learning is a two-way process, so we both can learn a lot from each other. That’s great news. I would like to see at least 1 filmmaker who knows his trade. Presently cinema is contending with Politics for the profession with least qualification required.